Friday was a big day. I bought all the foods you’d associate with a very small and not very fun party (chocolate fingers, big bags of crisps, cake, a bottle of Coke) and once my housemate got back from her lectures to join me, I slipped into that Netflix-drunk feeling, that sort of limbo where it gets dark without you realising and your emotions go up and down with the plot. And I learned stuff. Sat there for thirteen episodes – six on Friday, seven on Saturday – ‘House of Cards’ quietly kidnapped me, and returned me a pound or two heavier and with eyeballs that feel like they’ve been rolled in sand. I’ve never liked Doug. He’s sycophantic and dull, and when he’s not dull he’s terrifying. When Rachel bashed him on the head at the end of last season, it was a big relief. But now he’s just sprung back to life, brand new and creepier than ever, and we have to watch him watching Rachel/Frank/the brunette physical therapist for A VERY LONG TIME. He goes too far, constantly, in every action he takes. Like ringing Heather Dunbar from the end of a corridor, dramatically cast in shadow. He’s a villain, and after thirteen episodes I felt sick at the sight of him. 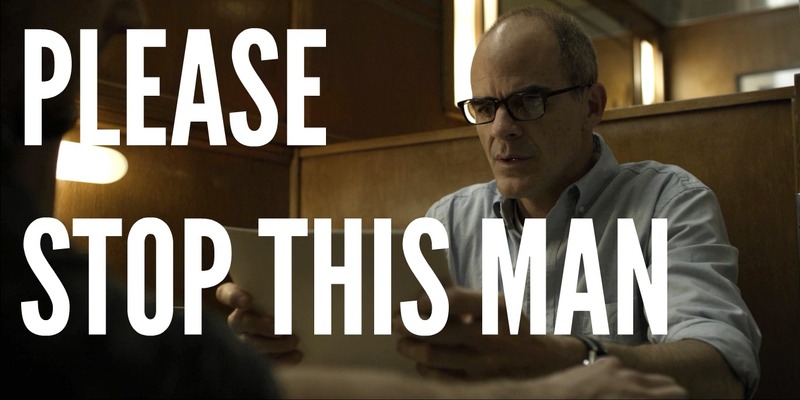 Looking at Doug Stamper is like looking into the void, and the void is staring back and asking you to syringe-feed it liquor. Season 3 is the season of Claire Underwood, and we’re blessed. While Frank grew greyer and made millions of personal and political mistakes in the manner of the man who falls for nine seconds, Claire became ever more beautiful, compassionate and wise. In growing, she makes Frank look sad, desperate and small. Claire should’ve been the 2016 candidate instead of Frank and we all know it. Whether she was conducting foreign diplomacy in the ladies’ toilet or calmly humiliating Petrov on the world stage, Claire just does everything very, very well. My Season 4 dream is Claire as the Democratic candidate, with Jackie and Heather and Remy Danton (maybe? I don’t know whether he’s coming or going) as her team. And me, trailing behind, handing her croissants and announcing she has a visitor while looking at her with love in my eyes. I want to be Claire’s Meechum, basically. Literally no one cares about this policy apart from Frank, so throughout the season we have to deal with him losing it whenever people don’t display the enthusiasm he clearly expects. He seems so neutral on everything else (his quiet little “Gay people have rights”) that his eagerness about this horrible, horrible plan stands out vividly. 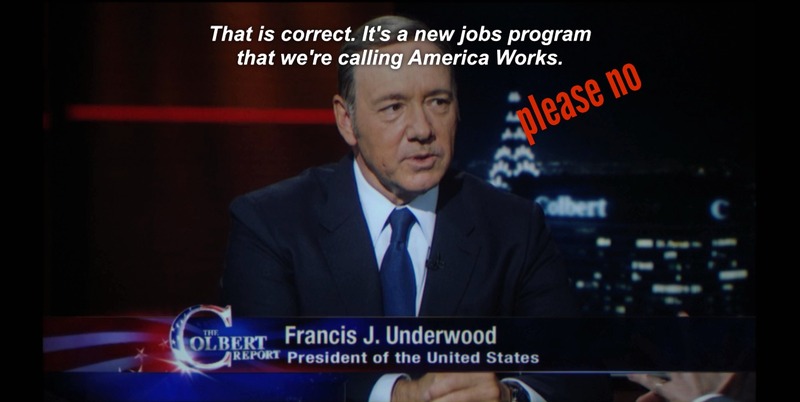 The final straw was Frank pushing and pushing for Tom to write an entire novel about America Works. Who did he think would possibly want to read that? Whenever Frank looks at the camera it’s like catching eyes with someone you love across a room. This season, he’s keeping himself to himself, and that hurts. Even when the things he said were silly and overdramatic, it felt special to be included – implicit. In this move away from the inside of Frank’s head, some of the glamour of his schemes and plans has worn off. Now we see him as he really is. Flailing, miserable, unrelentingly self-centred. When Claire walks out of his room at the very end, we want to follow her. By this I mean Lisa and Cashew the guinea pig. That guinea pig has outlived so many of our other Good People that I can only include her in this list. Rachel was a Good Person too, but apparently she’s another one Cashew has survived. I am desperately rooting for Lisa and Cashew to have some small measure of happiness, away from absolutely everyone in this programme. Let them live. 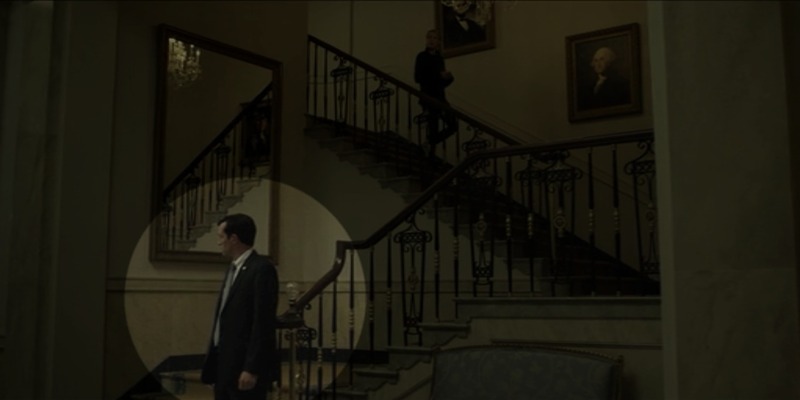 Like David Fincher apparently hid a Starbucks cup in every scene of ‘Fight Club’, season 3 of ‘House of Cards’ contains lots of subtle background moments of Meechum that will leak into your subconscious if you don’t identify them. He’s always there, ready to knock on a door and say “You have a guest,” or to move Author Tom far away from the Underwoods. He’s taken to wearing those massive sunglasses constantly, and talking only in rude little sentences. Meechum is absurd. I adore him. Things are SO BAD. Everyone is SO BAD. They are unstoppable and horrid and I cannot wait to see what they do next. Thirteen episodes was not enough. Because it’s such a good show, and this season was brilliant. A lot of the social commentary was surprisingly cutting – Frank pitting Heather and Jackie against each other, Petrov’s unrelenting simmering evil, the difficulties of productive activism when those in power always, always win. The political plotlines were simpler and more sensical, and as always the whole thing looked stunning (the monks’ sand art!). 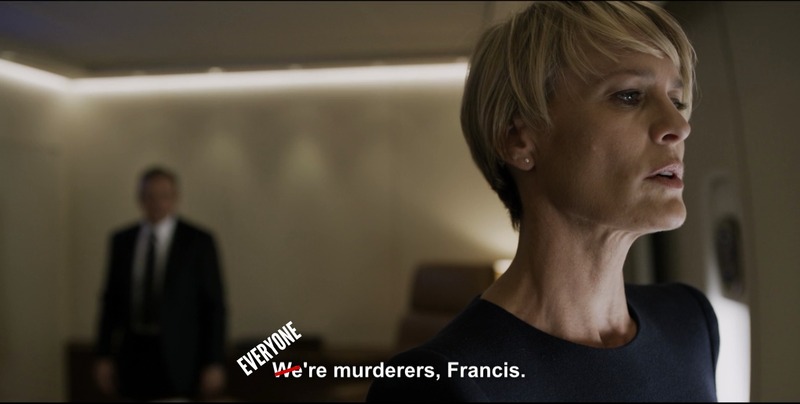 It feels like real effort has been taken to undermine all of the tropes ‘House of Cards’ sometimes falls into – who, really, idolises Frank as a master manipulator now? – and even our bad guys are human. Frank is a nightmare, but his moments of tenderness are many: his phone conversation with his old college flame, his (occasional, and nowhere near frequent enough) kindnesses towards Claire, the sort of pathetic figure he cuts after being honest with Tom. Binge-watching ‘House of Cards’ was fun and scary and amazing and I am already gearing up for doing this all again when Season 4 appears.